It appears that Las Vegas during the summer is now the norm for us. Last year we made the trip in June to visit family and this year we made it July to catch the NBA Summer League games (and also visit family while we were there). I can't say the weather is all that lovely in the summer. 110 is not particularly enjoyable, but luckily most of the things we do are inside. This trip I did quite a few free activities on my own while Eric and his friend Alex spent the day watching basketball. I had already done two full days and was ready to do some Vegas stuff. We also got off The Strip for some meals and other stuff. 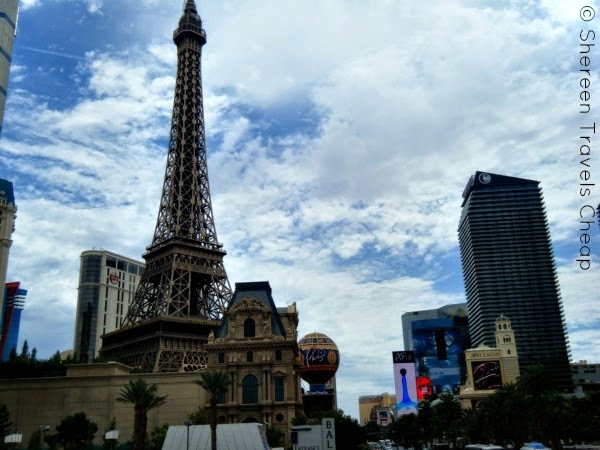 Now, you know I like to do as much interesting free stuff as I can in order to offset the prices of paid things and dining, which can really add up quickly in a place like Vegas. We are also lucky to have family that works at the MGM resorts, so we can get discounted shows and attractions when we go too. You can get some of these same deals if you know where to look. 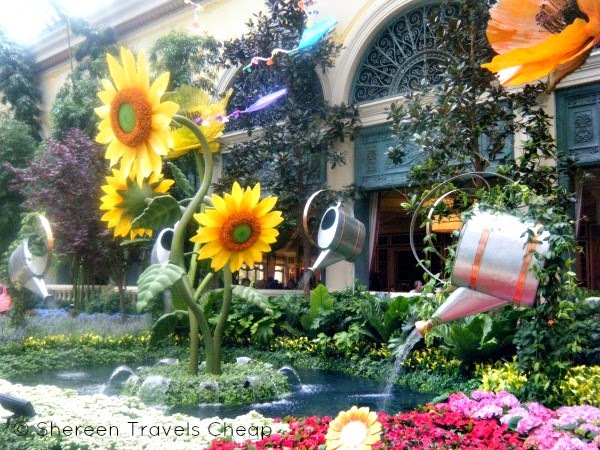 Bellagio – I think you can get the best bang for your non-existent buck here. 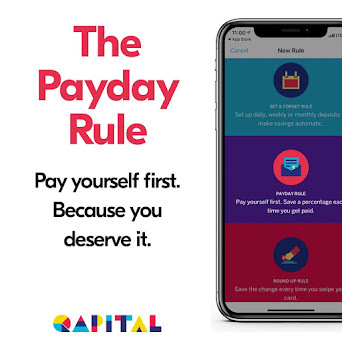 You can spend a lot of time not spending a dime, though at some point you probably will want to eat. Window shop at the upscale fashion shops at the Via Bellagio corridor that leads to Caesar's Palace. This is where you'll find stores like Louis Vuitton and Prada. 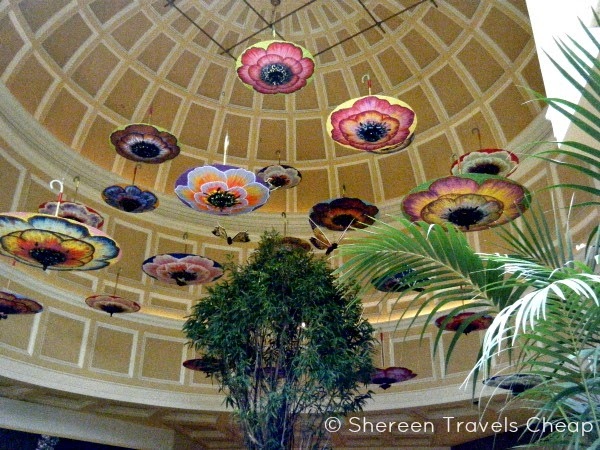 It's worth taking a stroll along this stretch of the resort just for the window displays and the wall and ceiling decor. All day you can watch runway videos from Chanel fashion shows, giving you a front row seat at some of the most prestigious shows in the world. 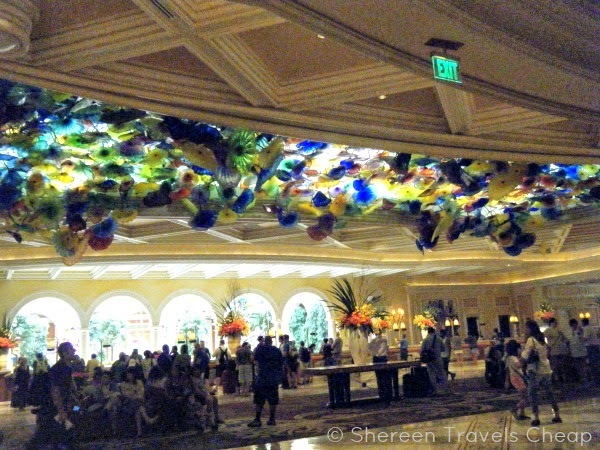 Head to the lobby and take in the amazing Chihuly floral sculpture that spans the majority of the ceiling. There are also some beautiful fountains and other sculptures to check out before you enter the conservatory and botanical garden. The greenhouse ceiling is amazing and the theme of the conservatory changes with the season and holidays, so it's always different when you visit. When I visited, it was adorned with giant garden tools, snails and frogs made of flowers and tons of sunflowers. There are also ponds filled with koi and live entertainment throughout the day. The great thing about the conservatory is that it is open 24-hours a day, so if you feel like looking at plants and fish and birds (did I mention there's an aviary with adorable finches?) at two in the morning, you can! Beyond the conservatory, you'll find some specialty shops and Jean-Phillipe Patisserie. It sells delicious coffee drinks, hand-made pastries, crepes, sandwiches, wraps and salads. 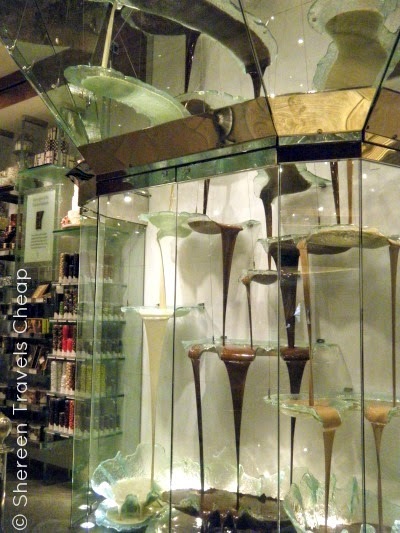 The focal points of Jean-Phillipe are the breathtaking wedding cakes on display and the World's Largest (and most interesting) Chocolate Fountain. Though not cheap, this is a nice place to order lunch and then sit overlooking one of the hotel's pools. Obviously, there are other shops that are reasonably priced and at night, you can watch the dancing fountains. if it's too hot (and crowded) to go stand outside to watch, head up to the shops that overlook the water and you can get a great view from above and also hear the music, with the benefit of air conditioning. 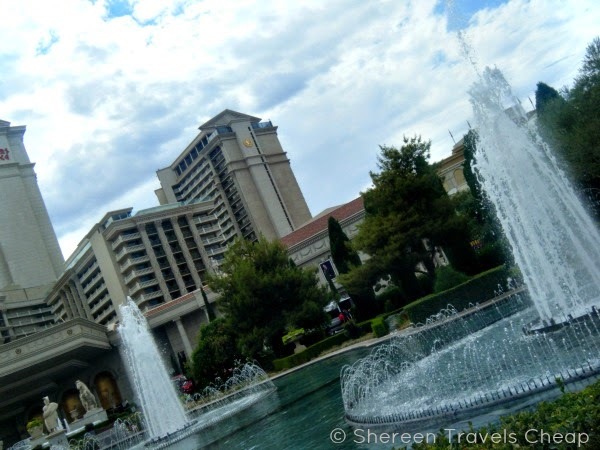 Caesar's Palace – this was another on-my-own activity. After the Bellagio, I meandered over the Caesar's to wander the Forum Shops and watch the Fall of Atlantis. 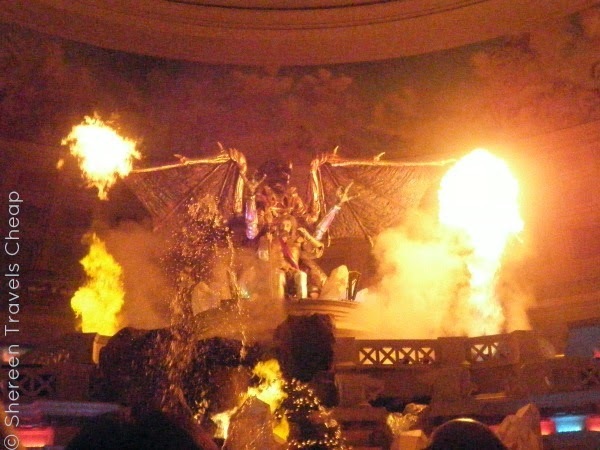 It's a free animatronic show that plays every hour throughout the day. I won't say it's phenomenal, but there's water and fire and thunder and it's a fun way to waste 10 minutes in between shopping, because one can only peruse H&M's three levels of chaos before you have to get out. If you don't mind waiting around for ten minutes near the Fountain of the Gods, then you'll get a decent spot and can listen as everyone else freaks out that they won't be able to see or that someone is standing in front of them. It's all above your head anyway and if you miss it, you can come back in an hour. For watching a free thing, I was quite amused by everyone's grumblings. Of course some of the best freebies at Caesar's are decor-related. 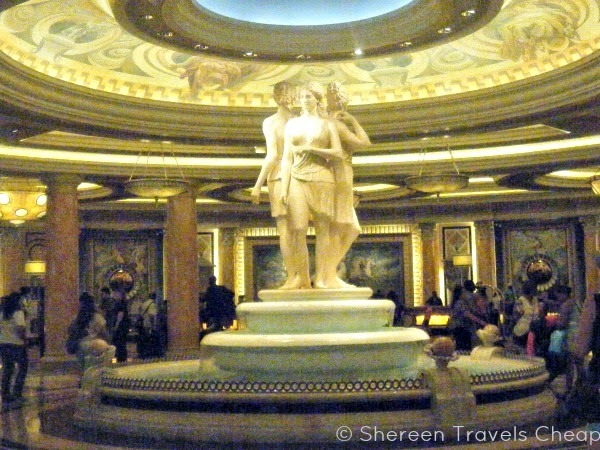 Go outside and check out the amazing fountains, columns and statues then go inside and look up as you walk around. It's truly the details that make the experience. They have named their concert venue The Colosseum. While you can't go inside to see what it looks like, the outside is all Roman architecture. It's pretty awesome. 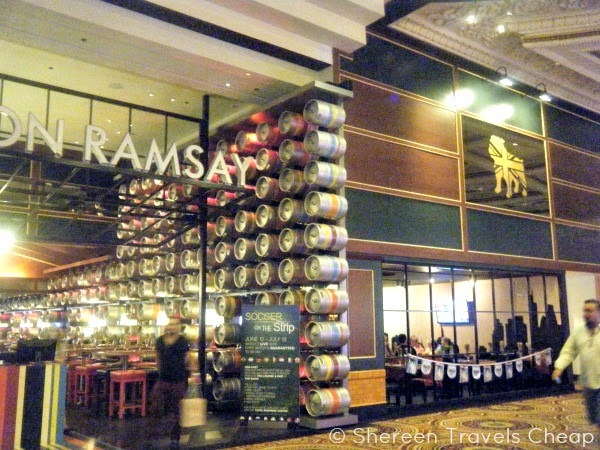 Once you've saved your money by doing the free stuff and shopping the sales (that's what I did), splurge on a fabulous lunch at Gordon Ramsay Pub & Grill. Choose from traditional British dishes with a fun twist. Eric declared his Coronation chicken "worth $17", which tells you something, because I don't think he's ever said that about anything he's ever gotten anywhere. You're obviously paying for the name, and nothing is spared on the decor either, but the portions are large and you don't leave hungry. In fact, we both finished our meals and were a little disappointed we couldn't add an order of sticky toffee pudding to our bill. 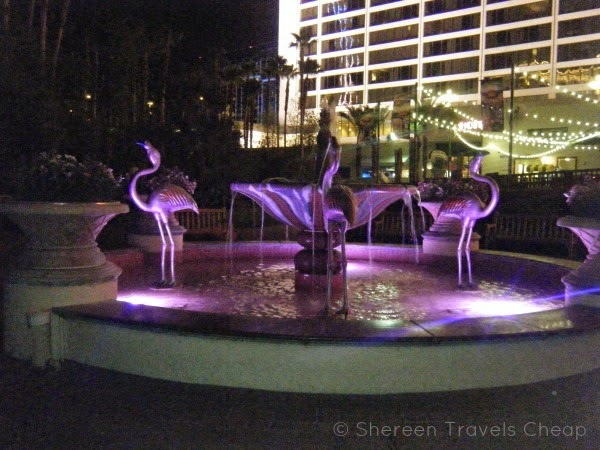 The Flamingo – As many times as I've been to Las Vegas, I don't remember ever going to the Flamingo. The whole place is packed with slot machines, which is awesome if you like to gamble. They also have several affordable restaurants including Carlos 'n Charlie's. Right across from the food court and next to the bar are the doors that lead out to the Wildlife Habitat. 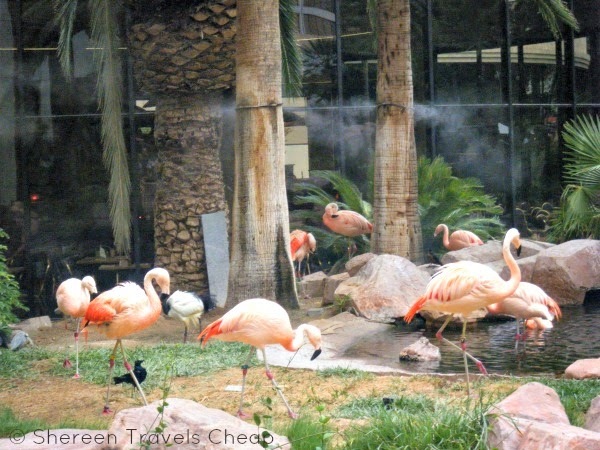 It's open 24-hours a day, but it's best to visit during the day, so you have a better view of the resort's flamingos, ducks, swans and other animals and can witness one of the two live feedings. You'll also see a lovely waterfall and flamingo fountain among the shaded walking paths and bridges. Obviously, there's more to do for free in Vegas, but we'll get to that next time. 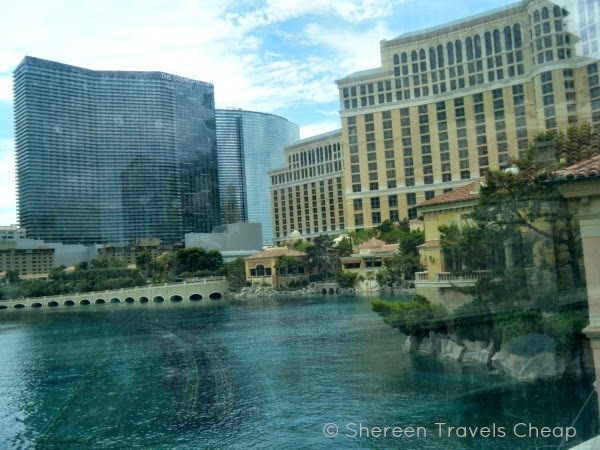 What are your favorite things to do in Sin City?